Check out our great deals on Canon Ca131 toner cartridges at InkTonerWeb.com! This compatible Canon Ca131 ink cartridges from InkTonerWeb.com includes 4 colors: Ca131 Cyan, Ca131 Magenta, Ca131 Yellow, Ca131 Black. They are guaranteed to perform with your Canon imageCLASS LBP612CW, MF632CDW, MF634CDW laser printers. They replace the original Canon Ca131 Cyan, Ca131 Magenta, Ca131 Yellow, Ca131 Black toner cartridges. Our compatible (generic) replacement Ca131 toner cartridges are made in ISO9001 & 14001 factories and meet the highest standards of quality, reliability and exceptional yields, offering high-quality printing results as OEM Ca131 Cyan Magenta Yellow toner cartridges. Our Canon Ca131 compatible toner cartridges are guaranteed to provide the same high print quality as the original brand name Canon CCa131 compatible toner cartridges. 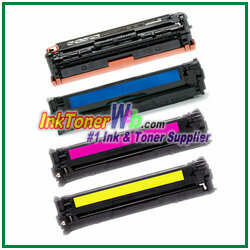 Purchase Canon Ca131 premium compatible toner cartridges from the #1 ink & toner supplier - InkTonerWeb.com. Your online shopping experience will be the most enjoyable. Order your Canon Ca131 compatible toner cartridges fast!